Where do ground balls come from? One of the main goals of research, which spans everything from high-energy particle physics to renting an apartment in a new neighborhood, is cutting through fluff and misinformation. Can this strain of bacteria actually cause liver failure? Is this school district a place I want to send my kid for the next ten years? And while much of the research is data collection and processing, a large piece of the fluff and misinformation comes from various cognitive biases and other breakdowns of logic. Good research will rely on a system of internal safeguards to avoid as many of these pitfalls as possible. But what about biases on a broader level? There’s an effect that’s seen even in some of the most rigorous academic fields of research—the publication bias. Like every other business, academic journals are competing for dollars and readers, so they would rather publish groundbreaking, provocative studies over uninteresting work, regardless of actual importance. This is a problem. Studies, even ones that are well-designed, run into fluky rashes of luck all of the time. It’s up to others to repeat and retest the results to confirm or deny an outlandish claim. But when journals have a bias towards printing exciting claims while ignoring the sensible rebuttals, we end up with halfway-supported claims and loose ends in search of closure that are cluttering up the place. This is all a long-winded way of saying that while it’s important for baseball analytics to make noise when pushing back some areas of long-held traditional baseball thinking, it’s also just as important to note when the evidence supports conventional wisdom. On that note, what does traditional baseball say about groundballs? Down, down, down. Keep the ball down in the zone, with a combination of sinking fastballs and breaking pitches with downward movement. Let’s examine these claims individually. Keeping pitches low in the zone to induce weak groundball contact makes a whole lot of intuitive sense. If the batter doesn’t go all the way down to get the ball, he’d beat the pitch into the ground. But does the data agree? I took every pitch thrown in the 2012 season and filtered out everything, saving only the pitches that were successfully hit into play. This totaled nearly 120,000 pitches in all. Do pitches thrown lower in the strike zone get hit more often into the ground? If we divide the strike zone into nine zones, slicing the territory out of the zone into quarters, we get a diagram like this. Pure red is mapped to zero groundballs hit from that zone. 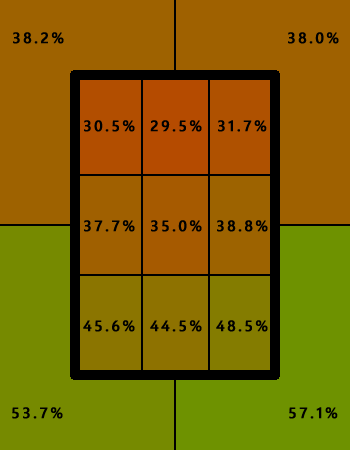 Pure green is the opposite, where every single batted ball out of the zone was a groundball. So far, so good. Lower pitches produce more groundballs, all else equal. Using the same dataset, I divided every pitch hit into play by pitch type. I excluded some of the pitches rare enough to throw off sample size flags, like knuckleballs and screwballs. Again, the data isn’t at odds with conventional thinking. Sinkers and splitters fare the best, with two-seam fastballs and curveballs not far behind. Sure, two-seam fastballs turn into groundballs at a decently high rate, but are some two-seamers more conducive to groundball contact than others? This time, I broke a standard pitch movement chart into one inch by one inch squares, and again, calculated the ratio of groundballs to other types of batted balls for each region. I also divided pitch velocity into sections one mph wide, and threw it in the mix. To put it in more concise terms, every pitch can be expressed with three coordinates—horizontal movement, vertical movement, and velocity. I divided this three-dimensional space into one horizontal inch by one vertical inch by one mph cubes. To make a long story short, what follows is a table of the most groundball-inducing attributes, broken up by pitch type and movement/velocity. So what can we learn from all of this? A lot, actually. And, as you might have expected, most of it meshes well with conventional baseball thinking. Velocity rules. Every single pitch type had a positive correlation between velocity and groundball percentage. The harder you throw, the more grounders you get. Tailing movement is huge, especially on sinkers, two-seam fastballs, and changeups. And with that, keeping the ball down is also a large factor. Two-seam fastballs and sinkers that exhibit zero positive vertical movement (or even a small negative one) are incredible groundball weapons. For pitches that aren’t big groundball factors, like cutters and four-seam fastballs, changes in velocity or movement don’t affect groundball rate by much, if at all. All data from Daren Willman’s excellent, excellent PITCHf/x database. Seriously, go check it out. You won’t regret it. The NY Times had an article last year that highlighted the extreme length of one of the Yankees’ RP’s to show his longer step produced a “faster” fastball as the ball traveled less distance until it reached the batter. The same article also mentioned how “late movement” which if I recall was defined as movement in the last 10 feet before home plate produced both more misses and more ground balls. Might be a big question, but is the BABIP on grounders from different pitches pretty much the same? If I remember correctly, the BABIP on ground balls tends to be higher than that BABIP on fly balls, with both being significantly lower than the the BABIP on line drives. However, ground balls have a much lower percentage of turning into extra base hits and I have never seen one turn into a homerun. Huh, I always figured that softly thrown pitches would be hit for less distance (see any physics textbook for why), but clearly it must be easier to adjust and add loft on a slower pitch. L/R splits would be an excellent follow-up, too. The relative ease with which the so-called male professional baseball samermatrician analyst associates particle physics with his own long division calculations…silly, and all too common within the genre. Aliens didn’t build the pyramids, kids. People did, and then they forgot how.